Apply for new membership, renew your existing membership, or scroll down to register for Irish Language classes and/or Dance classes. Payment link appears after you submit your form. Please read and follow these instructions carefully; otherwise, your registration and/or payment might be rejected. (1) Please enter the information for the appropriate section - Membership, Irish language or Irish dancing. (3) Proceed to the payment section and select the appropriate amount from the drop-down menu. Please note that there are three payment sections, one for Membership, one for Irish language, and one for Irish dancing. (4) Click "buy now". 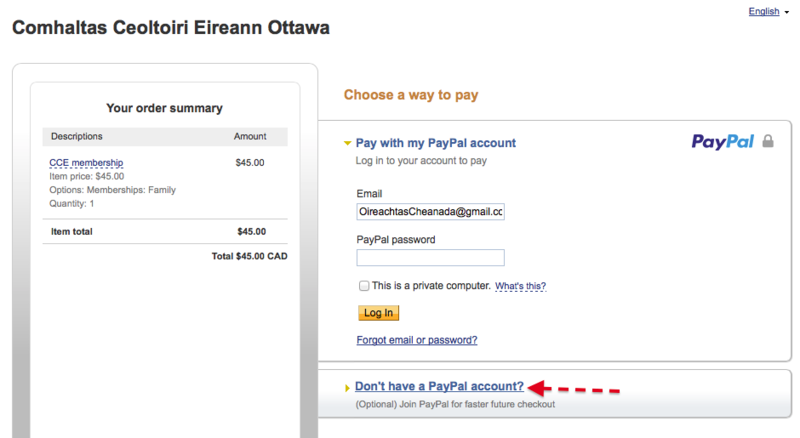 The default form of payment is via PayPal account, but if you do not have one (see image below), you should select the link "Don't have a PayPal account?" click on the link and it will take you to the page where you can select your credit card, and proceed with your payment. Please note that when you are taken to the payment page, and you are paying for Language or Dance classes, PLEASE SCROLL DOWN THE PAGE TO SEE THE APPROPRIATE PAYMENT SECTION. Otherwise, it looks as if you are back on the Membership payment page. (5) If you are doing more than one registration, say membership and Irish dancing, please do them separately. Member(s) Name. Please list names of all family members to be included in the membership. I expressly give permission to Ottawa Irish Arts (CCÉ Ottawa Branch Inc.) to send me communications related to OIA activities (must check the box to receive any information from OIA Branch). Personal information provided in this form will be stored in the Ottawa Irish Arts (Comhaltas Ceoltóirí Éireann) membership database and may be accessed and shared within the Comhaltas movement by executive officers and employees of Comhaltas Ceoltóirí Éireann (Ireland). Once you are satisfied with the information you have provided, please click the "Submit" button. You will then be taken to the payment section (link to PayPal). Applications cannot be processed until payment has been received. Thank you. If you prefer to download and mail the membership form with your payment. Check here to download the form. Beginner: have never done any Irish, ever. Advanced Beginner: have previously done some Irish but need a refresher. Intermediate: has a reasonable level of fluency; can participate in everyday conversation, can read simple Irish text and writing simple sentences. Advanced: has a good to high level of fluency. Language instructors accept drop-in students, payment can be done directly onsite ($8 Members; $11 Non-Members). Please note that when you are taken to the payment page, and you are paying for Language classes, PLEASE SCROLL DOWN THE PAGE TO SEE THE APPROPRIATE PAYMENT SECTION. Otherwise, it looks as if you are back on the Membership payment page. Dance Instructor accepts drop-in students, payment can be done directly onsite ($11 Members, $15 Non-members). Please contact cscrockard@hotmail.com for details. Please note that when you are taken to the payment page, and you are paying for Dance classes, PLEASE SCROLL DOWN THE PAGE TO SEE THE APPROPRIATE PAYMENT SECTION. Otherwise, it looks as if you are back on the Membership payment page.